Significant progress has been made in the development of biodegradable plastics, largely from renewable natural resources, due to increasing environmental concerns of rising proportion of plastics packaging waste, a Plastemart report said. Sales of single serving portioned coffee machines have increased six-fold since 2008, making up 75% of coffee machines sold in 2014. With global sales of coffee pods in the billions, the result is enough rubbish to circle the planet more than ten times, the report said. A new 100% compostable coffee capsule made from thistles has been unveiled by Lavazza, the Italian coffee giant. Jointly developed with Italian biopolymer company Novamont and Turin’s Polytechnic University, the patented pod is the first of its kind to be wholly biodegradable. A single-serving container when popped into the specialized coffee maker results in an easy pre-dosed brew while the empty shell disappears into the machine’s collection receptacle. The new patented compostable pod represents a 70% reduction in greenhouse gas emissions. The pod is made from a material called Mater-Bi 3G which is a patented bioplastic produced from wild thistle in three plants in Sardinia and certified for organic recycling according to EU compostable packaging standard EN 13432. The plant-based pod has not affected the flavor and odor. But coffee and scent are intertwined more intricately than just the smell of freshly brewed espresso, according to Plastemart. Meanwhile, the BIOMAT Research group from the University of the Basque Country in Spain has developed a new biodegradable/compostable container for both liquid and solid oily products. The container is transparent and, at the same time, provides a strong barrier for keeping out UV light and gases like oxygen. Multi-layer laminates are generally used as a barrier against gases, yet the product developed has a single layer, which cuts its cost considerably. Furthermore, it can be thermally sealed and is printable. The demand by consumers for products that do not contain synthetic chemical compounds has led to a growing interest displayed by the food industry in the development of active containers with natural additives, the report noted. The BIOMAT group has manufactured an active container with natural antioxidant agents for full-fat, fat or semi-fat cheeses, and cheese portions. Tetra Pak launched a carton made entirely from plant-based, renewable packaging materials – the new Tetra Rex carton that will be the first in the market to have bio-based low density polyethylene (LDPE) films and bio-based high density polyethylene (HDPE) caps, both derived from sugarcane, in addition to Forest Stewardship Council-certified paperboard. Developed in partnership with Braskem, the new Tetra Rex package is commercially available in early 2015. Tetra Pak customers using the standard 1-L Tetra Rex with TwistCap OSO 34 can easily transfer to the new version without the need for any additional investment or modification to their existing filling machines. The package is manufactured solely from a combination of plastics derived from plants and paperboard, the industry’s first of its kind. In these cartons, the LDPE used to create the laminate film for the packaging material and the neck of the opening, together with the HDPE used for the cap, are all derived from sugar cane. New Frontier Foods, a San Francisco area-based company offering a line of flavored snack chips made from seaweed, has chosen to use a flexible pouch package for its chips made from Innovia Films’ NatureFlex bio-based packaging. Derived from sustainable wood pulp, NatureFlex is certified compostable and offers high barriers to oxygen and moisture to extend shelf life. 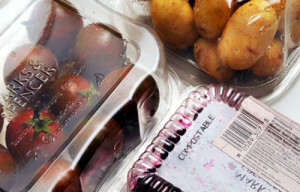 These bio-films are based strongly on renewable resources (wood-pulp from managed plantations) and are certified to the European (EN13432), American (ASTM D6400) and Australian (AS4736) norms for compostable packaging. In addition, the majority of grades have been certified by Vinçotte to the OK Compost Home standard for home composting and certain grades have been proven to biodegrade in a waste-water environment. Further testing has proven that most NatureFlex grades are also suitable for anaerobic digestion. These films use novel heat seal-resins on each side. They are static free and offer a super wide heat seal range for outstanding machine performance. The films offer good gas barrier properties and the coatings can be tailored to provide varying degrees of moisture barrier, depending on the needs of the wrapped product.